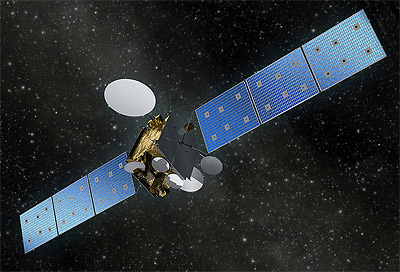 The german Heinrich Hertz or H2Sat aims to explore and test new communications technologies in space at a technical and scientific level in order to determine how broadband communications, for example, can result in high data rates for mobile final users. The development is performed by OHB System on behalf of the space agency of the German Aerospace Center (DLR) using funding provided by the German Federal Ministry of Economics and Technology (BMWi) with the participation of the Federal Ministry of Defence (BMVg). The contract to build, launch and operate the satellite was signed with OHB in June 2017. Besides the scientific and technological part of the mission on behlf of the German Federal Ministry of Economics and Technology (BMWi), there is also a cooperation with the German Federal Ministry of Defence (BMVg) to provide additional and independent communications for the german armed forces (Bundeswehr). OHB will build the satellite based on the SmallGEO bus. Heinrich Hertz is planned to be launched in 2021. Heinrich Hertz (H2Sat) - 2021 Ko ELA-3 Ariane-5ECA with ?